Place the beans in a bowl with the garam masala, coriander and cumin. Heat the oil in a small frying pan and cook the onion, garlic and chilli for 3 minutes until the onion is softened. Add to the beans with plenty of seasoning and mash the ingredients together thoroughly. Shape the mixture into 16 small balls and thread them on to small wooden skewers, 2 per skewer. Chill until needed. 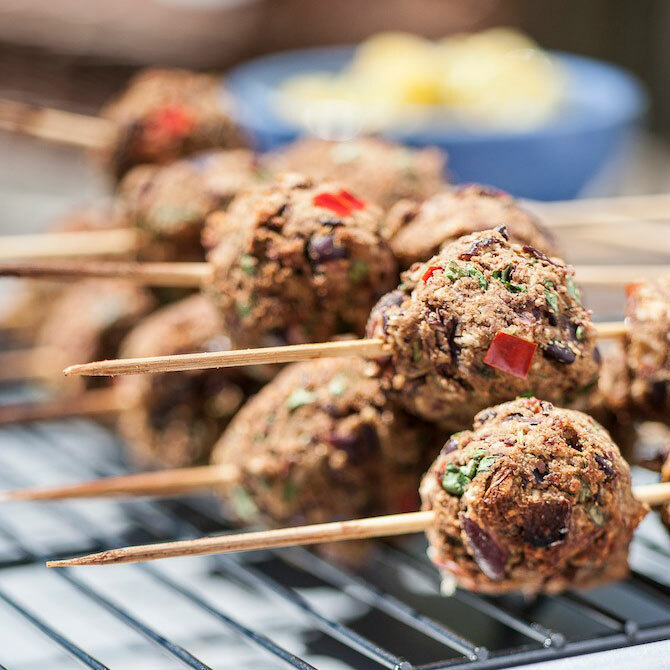 To cook the koftas, place the skewers on the hot grill and cook for 6-8 minutes, turning regularly, until browned. Serve straight away. Busy mum's lifesaver: Soak wooden skewers in cold water for at least 30 minutes before use to prevent them burning. Be warned, if you use metal skewers the koftas will fall off as they cook – I'm talking from experience here. Heat the butter and oil in a large saucepan over a medium-low heat. Add the onions and sweat gently, stirring, for about 10 minutes, until soft. Add the garlic, bacon and squash and stir for a couple of minutes. Add the pearl barley to the pan and stir. Make sure all the barley grains are well coated with butter and oil. Add the stock and stir occasionally. 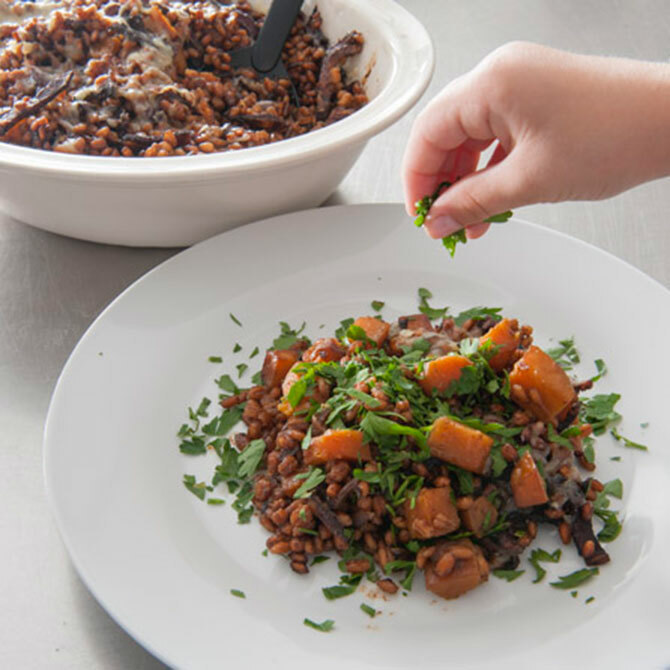 It should take about 35 minutes for the pearl barley to cook to a tender texture with a hint of bite still in the grains. By this time the squash should be completely tender too. Stir in the chopped parsley and grated cheese. Add salt, plenty of black pepper and a few gratings of nutmeg. Top with more grated cheese and serve. After a Sunday roast, this is the perfect way to use up the left over chicken. Just use how ever much you have to hand. Put all the ingredients into a large pan with a lid. Bring to the boil and then simmer gently for around an hour. If you're freezing it to use at a later date, then do reduce the stock (by boiling it down without the lid on). Chop all the vegetables up into chunks - I dice them up small, but if you like it chunkier, then do larger dice. Soften the leeks/onion in butter or oil in a heavy based pan, then add the diced vegetables and sweat them gently for around 20 minutes. This slow sweating will help draw out the flavour of the vegetables. Add the stock and chicken, bring to the boil and simmer gently for another 20 minutes. Check the flavour and season accordingly. 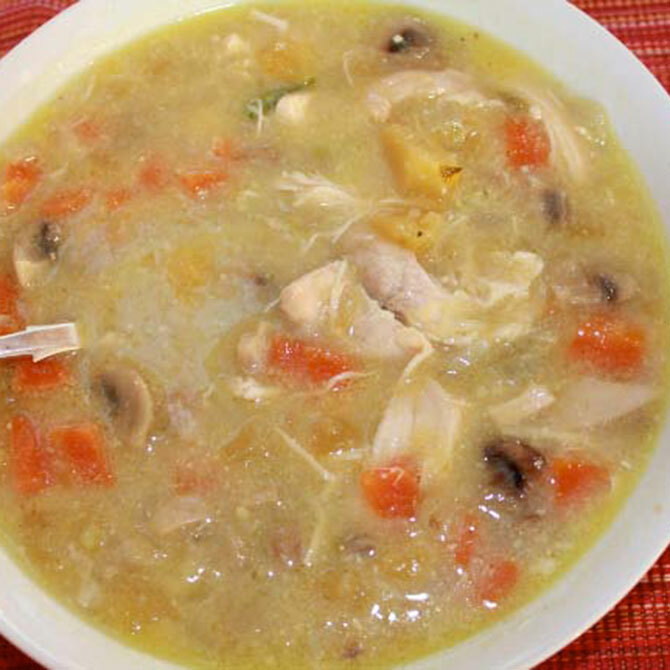 Serve with crusty bread (house rule: the more feeble the soup, the nicer the bread should be). 2. Peel and chop potatoes into bite size pieces. Add olive oil and butter to an ovenproof pan. 3. Place potatoes in pan and gently cook in the oven until tender, adding the turmeric. Put spinach into a new pan with tbsp of water and wilt down on the hob. 4. Whisk the eggs with the cream and add the spinach, season. 5. Pour over the potato in the pan. 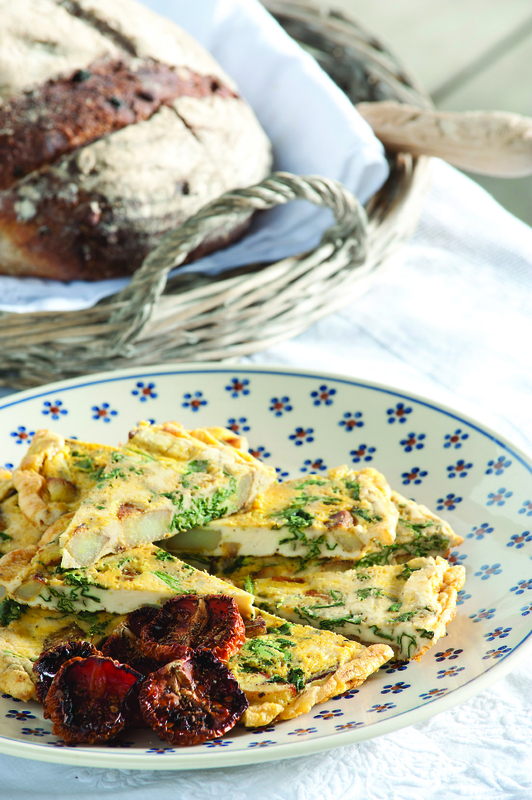 Once the frittata is beginning to set, put it into the preheated oven and cook for 10 minutes, until firm to touch. 1. Halve tomatoes, place on a baking sheet and sprinkle with sugar, salt and pepper. 2. Turn your oven on to its lowest setting, about 100°C, roast for about 3-4 hours until they shrivel up nicely. 2. Peel off the outer leaves of the cabbage (I cut out some of the tough rib at the bottom of the leaf), then core and shred the rest of the cabbage. 3. Bring a large pan of water to the boil and blanch the big leaves (put them in the boiling water for a minute or two and then rinse in cold water - i.e. don't cook them). 4. Fry the bacon in the oil until it's crisp, add the garlic and the drained, shredded cabbage and cook until the cabbage is tender (approx. 5 mins or so). 5. Remove from the heat and, in another bowl, combine the breadcrumbs, Parmesan and egg. Then add the bacon cabbage mixture and combine well. 6. Stuff the large leaves with this mixture - lay the leaves out (inside up) and place a spoonful of the mixture in the centre of each leaf, then roll up, tucking in the sides (like a wrap) and lay them in a buttered baking dish with the seam downwards. Cover and bake in the oven for 25 mins. 7. 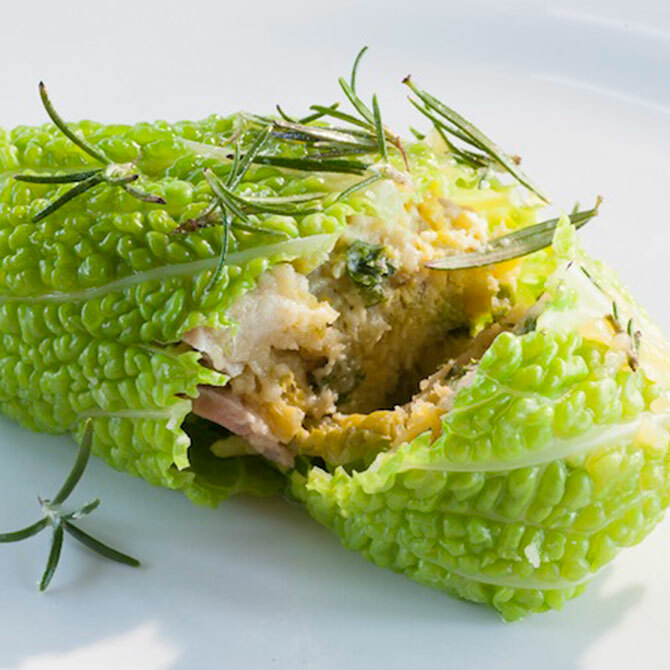 Melt the butter in a small pan and cook for a little while until the butter browns a little, then add the rosemary, remove the cabbage parcels from the oven and pour over the rosemary butter, sprinkle with Parmesan and serve.